"Spritz the bowl before you go and no one else will ever know!" 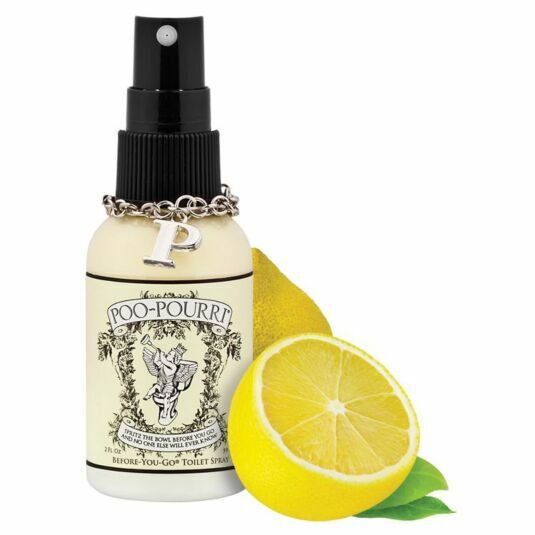 Poo-Pourri is the before-you-go toilet spray that will eliminate any potential bathroom odours at the source, while leaving your bathroom smelling like a bouquet of essential oils. Simply spray Poo-Pourri into the water in the bowl and it will form a protective barrier that will prevent any unwanted odours escaping. Watch the entertaining video below to learn more! This best-selling original scent features a fresh clean blend of bergamot, lemongrass and grapefruit. The bottle measures 11cm x 3.8cm x 3.8cm and contains 2 fl oz (59 ml). This will last for approximately 100 uses.